Jill Finley has been designing quilt patterns for over 15 years. Several years ago she launched her design business, Jillily Studio. She designs and sells quilt fabric, patterns, kits and notions. Her quilt designs depict her own fresh style using great color and texture with many fabrics. She usually adds a little appliqué to soften and finish each design. Her designs have been featured in several magazines including American Patchwork and Quilting, Quilt, Quilter’s Home and McCall’s Quilting. Jillily Studio produces the popular notions, Appli-Glue and Poke-A-Dots, along with numerous kits and patterns. 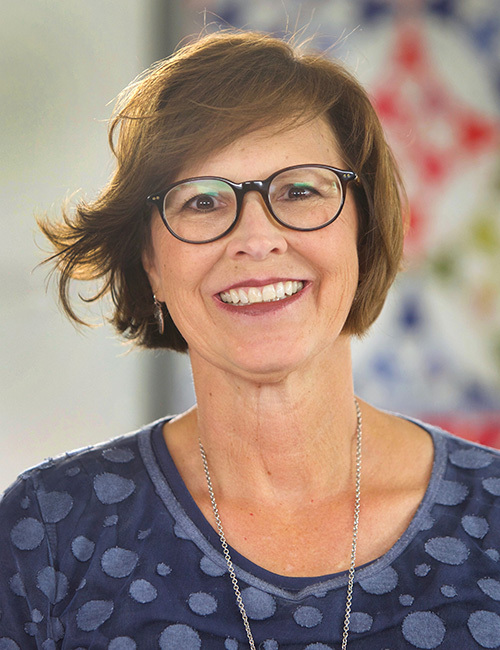 Jill is the author of several books on quilting, Home Sweet Quilt, Stitched Together, A Flair For Fabric, and I Love Log Cabins. She is a Master Designer for Aurifil Threads with her signature collections, Every Day Colors, and Sunday Best Colors. She is also a BERNINA Ambassador. Teaching and lecturing about her quilt designs and applique method keeps Jill very busy traveling all over the country. Creating fabric collections for quilting has been one of Jill’s favorite projects. Jill loves to spend time with her family; working, playing, eating, reading, gardening, sewing, cooking, and learning. She and her husband Randy live in Herriman, Utah. They are the parents of seven children and are blessed with ten grandchildren. Click here for a video about Jill Finley.